Is your hospital a breeding ground for healthcare-acquired infections? Anyone with a green thumb knows that a healthy plant has a “give-and-take” exchange with the soil in which the roots are embedded. Mineral nutrients essential for growth are drawn from the soil, processed and eventually returned back to the earth as organic matter. We don’t usually think of buildings, also “rooted” in the ground through their foundations, as interacting with the soil like plants do, each influencing the other. However, buildings and soil do interact in some very interesting and significant ways. The connection between buildings and the soil that we will discuss here is especially relevant to healthcare facilities, although the implications are important for any occupied building. 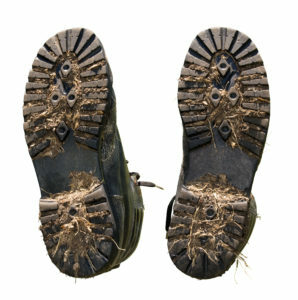 Soil enters a building on people’s shoes, via windows and doors, and by being drawn in by mechanical ventilation systems. Analysis of indoor dust shows that it is a mixture of outdoor soil, particulate matter from outdoor air, and organic matter from human skin cells, hair, cellulose fibers and plant pollen. Over 60% of indoor dust comes from outdoor soil! Outdoor soil in your building could be little more than a nuisance that requires cleaning to remove it. But, it could be part of a much bigger problem. Most antibiotics are produced by microorganisms such as bacteria and fungi that live in the soil. The first antibiotics used in patients, penicillin and streptomycin, were purified from soil-dwelling bacteria and fungi. How do these bacteria and fungi survive their own innate compounds? Interestingly, they carry resistance to the very antibiotics they produce! It makes sense that bacteria that naturally produce antibiotics need mechanisms to protect themselves from being killed by their own products. This self-protection is carried as DNA fragments in their genes, giving bacteria the ability to avoid harm from antibiotics by modifying or destroying them altogether. Could these bacteria, naturally containing antibiotic resistance genes, be a contributing factor to the rise in multidrug-resistant microbes? This question is especially relevant in hospitals where healthcare-acquired infections with antibiotic resistant organisms are a tremendous threat to patient health and patient safety. The DNA which encodes for antibiotic resistance in soil microorganisms is identical to antibiotic resistant genes in human bacteria. The passage of resistance between the soil environment and the hospital becomes a threat if genes conferring resistance can find their way into the microbes that infect humans. Another way that building conditions can increase the infectivity of pathogens is through exposure to extreme conditions. Once soil is inside a building, it is exposed to harsh environmental conditions in the walls and mechanical systems. These conditions, extreme to the soil microorganisms, cause the organisms to revert to “survival mode” forms. These forms can be even more virulent to humans, causing illness when the same microorganisms would be harmless in their native environment. Awareness that the building environment can make these pathogens even more dangerous to patient health and patient safety is yet another reason to keep buildings as free from dust as possible, not only in public areas, but also in hidden areas, such as behind walls, in ceilings, and within mechanical systems. We already know that keeping your hospital clean helps to reduce healthcare-acquired infections. But understanding why is just as important. Doing so will help you refine your cleaning tactics and keep your hospital healthier for everyone. Share your thoughts. Do you see the contaminants from soil as a potential problem for hospital cleanliness and patient health? Another reason for my shoeless house! Very interesting. Give everyone booties just like in the OR! Very interesting I dare to say. To maintain professional standards with shaking dust off your feet is easy and this kind of policy certainly remains within budget allocation.